The Canadian Museum for Human Rights in Winnipeg, Canada, was designed by Antoine Predock. Image courtesy of CNW Group. The museum’s base building was completed by the end of 2012. Image courtesy of 1ajs. The Tower of Hope is a 328ft-tall glass structure. Image courtesy of Ccyyrree. 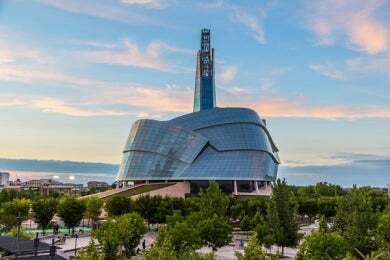 The Canadian Museum for Human Rights (CMHR), a new state-of-the-art national museum in the Forks historic site in Winnipeg, Manitoba, Canada, opened in September 2014. The museum is designed by Antoine Predock Architect, who won the international design competition for the project in 2004. CMHR is Canada’s fifth national museum and the country’s first museum built outside the Ottawa region. The concept for the Canadian Museum for Human Rights was born in 2003, when business leader, Izzy Asper, proposed an iconic structure that would be a symbol of human rights in Canada. Later that year, an international architecture competition was organised by the Friends of the Canadian Museum for Human Rights. It was decided that the $351m landmark would be built on the historic Treaty One territory. The ground-breaking ceremony for the museum was held in December 2008 and construction began in 2009. Construction of the base building for the museum was complete by the end of 2012 and the interior works were concluded by the third quarter of 2014. The CMHR building has a total floor space of 260,000ft² and consists of five main levels, three mezzanine levels and a 328ft-tall glass structure called the ‘Tower of Hope’. The average floor-to-ceiling height of each level is 17ft. The building’s design is inspired by natural objects, such as icebergs, clouds, tree roots and dove wings, which symbolise human emancipation and the hope for a changed world. The Broad Museum is a post-war and contemporary art museum being constructed in Los Angeles by philanthropists Eli and Edythe Broad. More than 80% of the building’s walls are sloped at unusual angles, making its geometrical and spatial structure unique in Canada. The building is supported by 444 precast driven concrete piles and 142 caissons resting on bedrock 25m below ground. The building’s south-west face is surrounded by a glass ‘cloud’, which houses a 10,010ft² ‘garden of contemplation’ featuring infinity pools and natural greenery. The cloud has a custom structural frame made of steel, and has up to 13 connections to one node and 60,000ft² of perpendicular, traditional scaffold for support. It was inspired by ‘dove wings’ which symbolise peace. Visitors entering the grand Bonnie and John Buhler Hall at the base of the museum are led through a series of crisscrossed ramps called the ‘Hall of Hope’, which connect the gallery spaces. The walkways lead to the observation deck of the Tower of Hope. Ramps nearly 1km-long were constructed of white Spanish alabaster. The museum features a tranquil spot, the Stuart Clark Garden of Contemplation, surrounded by water, greenery and Mongolian basalt rock. The building offers 47,000ft² of exhibit space and 2,300 ramps. It also features 11 gallery spaces, classroom spaces, office space, a theatre and a temporary gallery for travelling exhibits. CMHR is the first large-scale project in the country to have adopted a 3D modelling in a virtual design and construction (VDC) approach, covering the various consultant and contractor groups. The VDC technology was used to collaborate and coordinate the works from 40 different companies involved in this complex design-build project. "CMHR is Canada’s fifth national museum and the country’s first museum built outside the Ottawa region." A single centralised model database incorporating the project’s details was created, which included the 3D models, 2D drawings, specifications and schedules. The museum’s complex architectural design demanded the team to start with a 3D model, because the structure was impossible to rationalise in 2D sketches or AutoCAD. The geometrical planes and datum points were set and hand sketches were made to resolve the structure makeup after creating the 3D model. After the digital information was added to the model, the team simultaneously adjusted the details to make sure the model remained viable from all aspects. The construction of the CMHR involved over 175,000 separately cut pieces of basalt, limestone and alabaster. A total of 1,335 pieces of glass was used in the Glass Cloud and 334 in the Tower of Hope. The building’s interior uses 18,000m² Tyndall stone from Manitoba. It is estimated that 17,000m³ of concrete and more than 6,000t of steel were required to build the museum. The façade of the museum is covered by 1,200 pieces of glazing. Manitoba Tyndall stone, and concrete were used in the construction of the exhibition hall and Mountain galleries. The building and exhibits called for a total capital cost of $351m, which was met through public and private funding. In August 2013, $140m was raised from the private sector, while the national, provincial and the city authorities contributed $100m, $40m and $23.6m, respectively. The sustainability features of the museum building, including sustainable site development, indoor environmental quality, energy and water-efficiency, make it a contender for leadership in energy and environmental design (LEED) silver certification. The project has NMEC-standard energy-efficiency and stressed on natural lighting, apart from other sustainable features, such as ponds for storm water retention, waterless or low-flow fixtures, as well as the use of recycled content for metals, glass, aggregates and others. It also has non-toxic finishes and green roofs. PCL Constructors Canada was the construction manager for the project, while Yolles, a CH2M HILL Company, was the structural engineer and The Mitchell Partnership provided mechanical engineering services. Mulvey Banani International was engaged as the electrical engineer and Ralph Applebaum Associates worked as the exhibit designer.